And another good point - the skin color on the dummy does not match the Hollywood head. Hollywood: Do you need a body, or do you just want the head? Mossad: NO, people will be too stupid to see the mis matched skin color, just send the head, we want this cheap. 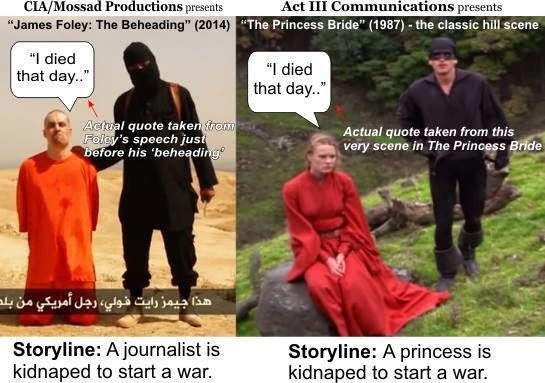 Isis beheading, a psy op - I waited to say anything about this because the Nick Berg video was fake. And this beheading is fake too, COUNT ON IT. The man doing the beheading is speaking with a British accent. That means no journalist lost his head and it is all a show. The related article is linked above, and this would explain why Britian says viewing the video is a terrorist act, because it is FREAKING FAKE. No kidding, British police say watching the video is an act of terrorism and you want to know why? Because it is FAKE AS FRUIT LOOPS. 1. Foley is smiling in parts of the video. 2. The beheader has a British accent. 3. No blood comes out when the beheading starts. 4. It then cuts, and you do not actually get to see the beheading. 5. When the video returns, you see a headless body. Bottom line, THERE IS NO BEHEADING VIDEO and that is exactly why, in Britain, trying to watch the video is a "terrorist act". The video is such a terrible fake those who fronted it are terrified of having people watch it. They just want you to believe, while never having seen it. You can watch this HERE, and you can ignore the gore warning, there really is no blood when the beheading starts and it just cuts to an obvious fake, with a perfectly clean cut head sitting on the body with a little fake blood and no spatters on the sand anywhere. I don't know if you noticed, but look at that Foley mannequin, the forearms, as in NO HAIR. If not a dummy, then either he or his "captors" shaved the hair off his forearms, LOL. Looking at the exposed "skin" of his right leg, looking at how shiny it looks, it definitely looks plastic to me. Does the video show more of the exposed "skin" of his body that gives a clue? I'd look there. Thanks. What I noticed most is the fact that the face color does not match the dummy. IF he was in the sun enough to get his face tanned, at least his hands should match. SO, what happened here is a silicone head was made or selected to match his face, (a simple task for Hollywood) and they got the skin tone right. But they used a generic CPR dummy for the body and that was a huge screw up. The only reason why I am saying CPR dummy rather than store dummy is because the CPR dummies are made to be like a real body and designed to flop around and have the weight and characteristics of a real unconscious body. This would make it possible to handcuff the hands in a natural position, but the hairless and color mis matched silicone is OBVIOUS, and the head mount is OBVIOUS, and the lack of any blood spatters away from where it was poured from a container is OBVIOUS, No wonder why the British police declared it an "act of terror" to watch the beheading video. With fakery that obvious the scammers who pulled this one had a LOT TO FEAR. From Mike Rivero at whatreallyhappened.com - "Right now the corporate media is shoveling ISIS at us as hard as they can, in an obvious propaganda campaign reminiscent of the similar campaign about "Al Qaeda" and "Osama Bin Laden" that preceded 9-11. Given how desperate the US Government is to revive the war agenda, we should be concerned that a new false-flag attack, bigger and bloodier than the World Trade Towers, is being considered. THAT is precisely why this fake beheading was done, to get people to hate Muslims so they won't care if millions get blown away. 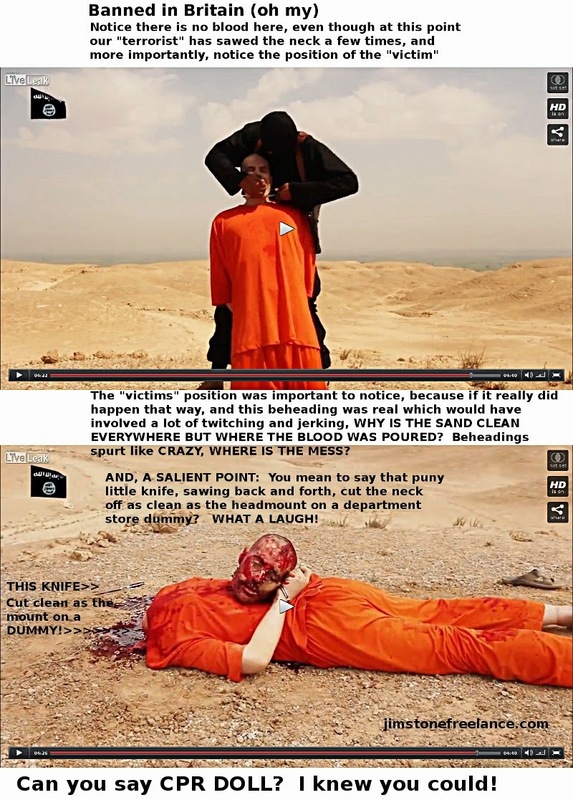 THE BEHEADING WAS FAKE, THE PICTURE BELOW PROVES IT, SPREAD THE WORD AND STOP THE NEXT 911. If we can bust them with this it will be game over, and I MEAN BUST THEM IN THE DELUDED "MAINSTREAM," the alternative press is all in the choir already.